Atropos floated up from her ethereal rest to begin her wanderings of the day. It was a day men called “Tuesday”, although such labeling meant nothing to the youngest of the three Fate sisters. She drifted from her slumber in the Spirit world toward the small blue globe, suspended and spinning in the Void. It was there that she’d find her next client. As always, Atropos didn’t know whom she’d serve, but knew she’d recognize him when she encountered him. Theo was sung awake by his wife. He grimaced, recognizing again that his stiff and throbbing joints always seemed to wake up before his brain. Thinking about it a little, he recalled that his arthritis was the last aspect of his body to lose consciousness at night, also. “Always there for me,” he muttered. She smiled down at him with love and dedication. I meant, my joint pain, Theo thought. He didn’t say it. He’d developed, over the years of their marriage, the ability to stop voicing the truth whenever his wife seemed happy with her interpretation of things. “You have a doctor’s appointment, today, Dear,” she reminded his failing brain. “I know,” he smiled at her, not recalling anything about a doctor’s appointment. He tried to visualize the doctor’s face, hoping that might trigger the memory of a name to go with it. “Dr. Schwartz,” his wife added into the silence, knowing instinctively it was the right thing to say. She grabbed his hand and pulled with all her power against his stiff body. He rose up slowly, like a plank of wood. Once past 45 degrees, she knew, gravity would relent a little and it would get easier. An hour later she had him dressed and sitting before his eggs and pills. “What are these for?” His swollen index finger plowed a wiggling path through the field of pills on a plate. Another hour and she finally had him in the car. 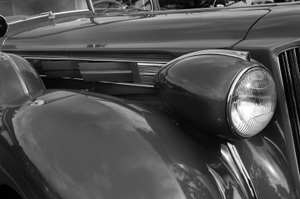 As she backed the Packard out into the street, arm muscles quivering as she wrestled with the gigantic steering wheel, a film of gossamer drifted over them. Atropos saw them as two glowing entities, suspended by threads which undulated toward the heavens: threads that had been spun decades earlier by her Fate sister, Clotho. The threads were so thin, that they seemed to disappear for long distances as eyes traced them toward the high cirrus clouds. For Atropos, the vast panorama between wisping clouds above and the furious chaos of glowing entities dancing below was a forest of glistening, twisting, bouncing, undulating threads. Over Theo’s Packard, she found her client. By one p.m., the exhausting ordeal of a visit to the doctor was finished. The physician had spent his traditional five minutes with them, reassured them of the correctness of Theo’s regimen, and ushered them toward the scheduling books and the front door. “After lunch, you’ll take your nap,” his wife told him. She set down a bowl of soup. “I’m not that tired,” he bragged to her, beaming with pride. He tucked in his napkin, to protect the recently washed shirt. They both laid down to stare up toward the familiar ceiling, still fully dressed except for shoes. She first helped him, of course, then crawled onto the bed next to him. They both fell, as if a trap door beneath them had opened suddenly, in a plummeting free-fall to sleep. Theo’s joint pain followed a little behind. Atropos, like a loose piece of cobweb, floated by, drew her golden shears and snipped the thread. The cut end floated down sinuously toward the darkening ember beneath it, passively blown in random directions by invisible currents and failing breaths. Satisfied that she’d accomplished her appointed task, the Fate whisped upward, rapidly piercing the clouds, then continued on to her realm beyond the planet. When their son came in for his usual afternoon visit, that’s how he found them: Theo snoring like a chainsaw, his wife silent and breathless beside him.